By aerial runners - pinch young plants off runner & repot under good strong light. This is great plant for beginners which does not require special care. 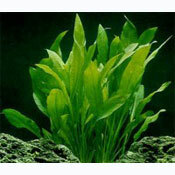 Suitable for planting in the middle of the aquarium as a central plant.